If the ‘P38’ generation of Range Rover was proof that the model was more of a luxury car than an off-roader, then the L322 generation that succeeded it completely cemented that belief. From the outset, the L322 would be a luxury car first and an off-roader second, albeit with the same legendary off-road ability expected of a Land Rover product. It was a car with an awkward gestation. Conceived by BMW at the time it took over the Rover Group in 1994, the vehicle was developed to use BMW powertrains (namely the 4.4-litre V8 petrol and 3.0-litre straight-six diesel engines), but by the time it was launched, Land Rover had passed into Ford’s ownership as part of BMW’s high profile divorce package from Rover Group. Confusing as its parentage may have been, the L322 was an immediate commercial success, the Range Rover brand proving that the general car-buying public cared little about what was going on in the boardroom. The car’s reception was tremendous when it debuted at the end of 2001. As both a luxury car and an off-roader, it was peerless - the only real negatives being directed at the rather substantial list price, but demand was such that Land Rover could get away with it. The styling was terrific - immediately identifiable as a Range Rover, with the same boxy lines, horizontal glass area and split tailgate of every predecessor, but in a modern-looking package, with a distinctive front end that would set the styling them for the next Discovery and the various Range Rover spin-offs that were to come. Inside, it was glorious. High quality leather, in black, grey or tan, with wood or aluminium trim detailing and steering wheel controls for the audio, phone and drive settings were extremely advanced for the day, while the all-round air suspension and off-road system could be operated via a central controller. 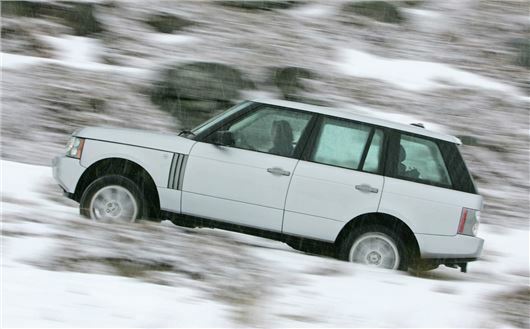 In 2005, the Range Rover had a major facelift, to effectively remove as much of the BMW content as possible. The engines were replaced by Ford-PSA’s 2.7-litre TDV6 diesel and the Jaguar-sourced 4.2 V8, which was available as both a normally aspirated and supercharged unit, the pair of which were quicker and more economical than the previous units, as well as much cheaper for Ford to install as they didn’t need to be bought in externally. At the same time, the model range was expanded to include the new Range Rover Sport - the first time the name had been used on more than one vehicle and the start of the brand’s expansion to a complete model range in its own right. The L322, then, was the car that truly marked the Range Rover out as a luxury object as much as it was a car. With that came good and bad. Its status obviously made it highly desirable, which in turn gave it very strong residual values. But at the same time, it attracted buyers that often had more money than taste. It became the ‘footballer’s wife’ car of choice, with various ‘bespoke’ models appearing, including a bright pink one with pink leather made especially for Katie Price. Meanwhile, white leather and pearlescent white paint became standard fixtures on the Range Rover colour and trim chart. Irrespective, the model was a huge success, and even now - almost 17 years since it first appeared - it remains a desirable used car and a sure-fire future classic, albeit one that’s not without its problems. Electrical systems and air suspension are notoriously problematic, while the 2.7 TDV6 engine, in particular, is known for being fragile, with crankshaft failure a very common problem. Corrosion is an issue, too, as the steel monocoque has a number of moisture traps present that can cause problems. The inner rear wheelarches are particularly prone, while tailgates also rot from the inside out. Remember, the oldest examples are now well over 15 years old, so this shouldn’t be too much of a shock - but with prices still upwards of £3500 for anything useable, it pays to be through when buying. An L322 Range Rover won’t be cheap to own or run - that much is guaranteed - but there are few cars that offer such a sense of occasion for so little initial outlay. I’ve just sold my Supercharged L322 for the only car that can come close to replacing it. A L405 supercharged! I"m on my 4th Range Rover L322, the last one had 275000 on the clock, and only sold it because I thought I probably should. The one I have now is the TDV8.which is the one to own. 30+ MPG. for this sort of luxury is exceptional. . Its very fast (the earlier diesel was underpowered) , has been 100% reliable, and nowhere can you find a more comfortable drive. As soon as you climb in to the drivers seat you get the same buzz each and every time. Something you only get in a Range Rover. Un ashamed luxury at a crazy low price. Why on earth would buy anything else. During facelift It had the 3.6 tdv8 and the 4.2 ajv8 supercharged and the 4.4 N/A jaguar engines respectively. Atleast get your facts straight before posting..